Perfect for those who love the city, but appreciate a quieter area at night. Our apartment is located in one of the most charming nooks of Krakow - a peaceful small street in Kazimierz, the lively one time Jewish quarter of Krakow. Comfortable, newly decorated and well-furnished 3 rooms apartment has all it takes to enjoy your holiday. Our bright, south-west-facing living room does not only offer practical things like TV-set+DVD+computer and free bradband access, but will also please your senses leading you to a wonderful, green and spacious (20 sq m) terrace with a view of a bend of the Vistula river, the Baroque St. Stanislav Church, the Wawel Castle and even the Tatra mountains (on a bright day). 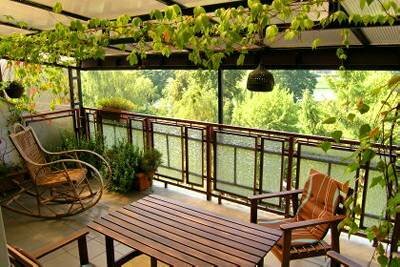 The terrace is equipped with comfortable garden furniture and the barbecue. If you feel like a nap, our cozy double-bedroom will make it a pleasant time in a large King bed. When eating out doesn’t suit you, our small but nice kitchen will allow self catering as it has all facilities for cooking and dining. The apartment has the bathroom (with bathtub, washing machine) and a toilet. Finally, the apartment has nice owners – they will do all they can to make you satisfied and happy. Our apartment is located in a peaceful lane in Kazimierz, the lively one time Jewish quarter of Krakow, a short walk from the main square. The riverside of Vistula is an excellent place to have a stroll, do jogging or just rest in the shade of trees. In the summertime, you can go for a pleasant boat sightseeing-ride on the nearby river. Not far from our apartment is a public swimming pool, an ice field,open daily air market, flea market and much more! There is also a guarded parking area nearby (10 min.). For those who are interested in visiting historic monuments, museums, galleries, churches and synagogues, our apartment is a perfect starting point. Krakow is only 20 minutes from Wieliczka (worldwide unique salt mines), 30 minutes from National Ojcowski Park, 90 minutes from Oswiecim (Aushwitz) and 2 hours from the Tatra mountains (hiking, skiing). We’d love to share our expertise and knowledge of Krakow with travelers and can provide you with a unique and rewarding experience only possible when you know the locals. 10 min. to a cheap guarded parking. Buses and trams within 2 min. walk. Five min. walk from the Old Market and main Jewish area with its 7 Synagogues. About 5-10 min. walk to plenty of nice places like galleries, antique shops, restaurants, original cafes and pubs.